On Wednesday, November 27, 2018, the League of Railway Women (LRW) hosted its first in a series of "Railroading 101" learning webinars. 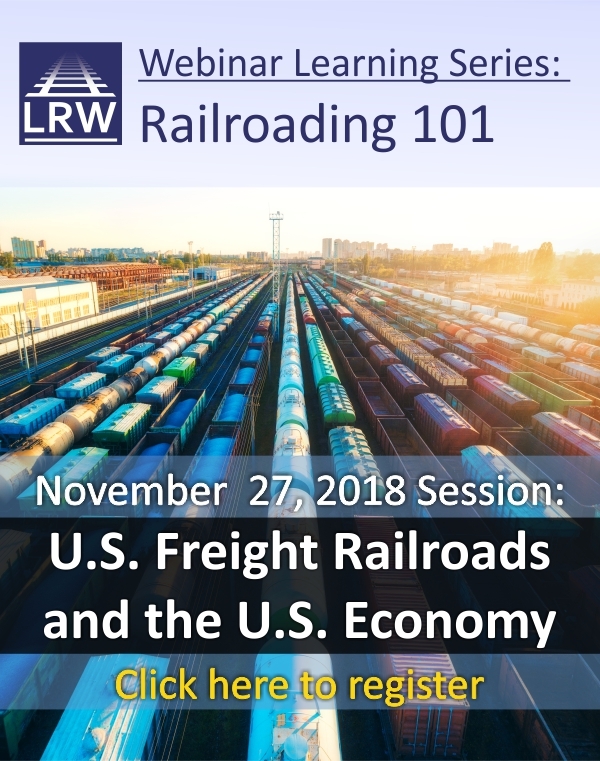 The webinar was moderated by LRW board member, Kari Gonzales, Vice President and Chief Financial Officer, Transportation Technology Center, Inc.
WASHINGTON, D.C., November 13, 2018 – The League of Railway Women (LRW), the nonprofit membership organization committed to improving the railroad industry by connecting women in rail, will hold a free one-hour webinar November 27 at 2 p.m. EST on "U.S. Freight Railroads and the U.S. Economy." The webinar will provide an overview of U.S. freight railroads, current trends in rail traffic and the U.S. economy. In addition, various policy issues of relevance will be highlighted, including a discussion of how those matters impact the economic outlook moving forward.